This coastline sentinel stands against a breathtaking morning sky. A combination of Cross and Half Cross Stitch achieves the realistic color shading in the sky and garden. An extensive palette of cotton thread worked on 18 count ivory Aida brings this guardian of the rocky shore to life. Kit contains cotton thread, 18 count ivory Aida, needle and easy instructions. -- Finished Size: 5" x 7" (13 x ..
Shells and blooms combine to create the still life entitled By the Sea. Imagine yourself at this relaxing seaside getaway as you stitch this Gold Petite design by Dimensions in counted cross stitch. Finished size: 7" x 5". Designed by Danhui Nai. © Danhui Nai / Wild Apple Graphics. 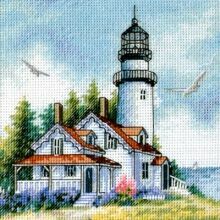 This counted cross stitch kit contains: presorted thread, 18 count ivory Aida, needle, instructions..
Lighthouse Sunset. Kit contains: 14 count white Aida, sorted cotton threads, needle, chart, instruction..
Mermaid. Kit comes complete with: 14 Count Aida Fabric, 100% Cotton Embroidery Floss, Beads, Sequins, #24 Tapestry Needle, Beading Needle, Fully Illustrated Instructions.. Imagine yourself in this warm, relaxing scene as you stitch this counted cross stitch Ocean design by Dimensions. A swaying palm tree, a comfy chair, a refreshing drink, and the sea—what could be more perfect? Part of the Gold Collection. Finished size: 5" x 7" (12 x 17 cm). Designed by Daphne Brissonet. Original artwork by Daphne Brissonet © Wild Apple Licensing. This counted cross stitch kit co.. This delicate Gold Collection counted cross stitch is a collection of beautiful treasures from the ocean. As if tossed up by the surf onto a sandy beach, these precious treasures delight the eye. Our seashell confection is worked on 18 count ivory Aida with cotton thread. Half Cross Stitch is used to create subtle shading. Kit contains cotton thread, 18 count ivory Aida, needle, and easy instructi..
Recall the childhood pleasure and delight of combing the beach for the ocean's offerings; even the smallest of shells was a treasure to cherish. Colors of the sun, sand, and sea are worked on 14 count white Aida to create this delightful montage. Kit contains cotton thread, 14 count white Aida, thread palette, needle and easy instructions. -- Finished Size: 14" x 11" (36 x 28 cm) -- Designed by: S.. Surrender to the eternal lure of the open sea. This square rigger with her masts standing proud and tall is framed with the reminders of a seafarer's life. Minutely detailed, this design is stitched on 18 count ivory Aida. Gold Petites - Gold Collection - Cross Stitch. Designed By Todd Trainer.. This nautical scene reminds us to cherish each day and enjoy the beauty of the world around us. Half cross stitch is used for artistic effect. Kit contains cotton thread, 14 count light blue Aida, needle, and easy instructions. -- Finished Size: 7" x 5" (18 x 13 cm) -- Designed by: Martha Edwards..